I’m delighted to announce that The Palladian Way book is now available to buy. To get your signed copy right now go to The Palladian Way page. We have almost finished way marking the route so its ready to walk! If you are interested here is a summary of the book from the media release. Local walker Guy Vowles launches his third walking guide The Palladian Way. The Palladian Way is a 125 mile walk through England’s finest Palladian estates in Buckinghamshire, Oxfordshire, Wiltshire and Gloucestershire. Palladian architecture, though often forgotten, is a popular classical style responsible for one of the world’s most famous buildings, The White House. Here in Middle England, we are lucky enough to have some of the finest examples of Palladian style. From the stature of Stowe House in Buckinghamshire to the intricacy of Prior Park near Bath you will be invigorated and inspired by this long distance walk through some of England’s finest countryside and estates. Guy Vowles’ book, The Palladian Way, gives a step by step guide to this architectural trail, with coloured photos, illustrated maps and recommendations for eating, drinking and overnight stays. When of interest, Guy delves into local history and influential characters of the period such as the famous landscaper Capability Brown, The Mitford Girls and Flora Thomson, author of Lark Rise to Candleford. 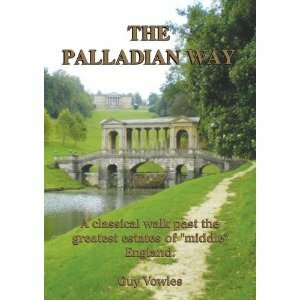 The Palladian Way is now available for purchase at £9.99 through Guy Vowles’ walking website, https://guysrambles.co.uk/palladian-way/.